A lift keptboatfor the last 10 years.This 270 Sundancer SE has seen great care and numerous updates over the years, but most in the last two.From all new cockpit upholstery to a new bimini and enclosure, and new risers and manifolds, she's both running and lookingher best.Seller's are looking for their next boat.It has bottom paint but has beenliftkept and high & dry the past 10 years.The boathas windlass anchor, VacuFlushtoilet & macerator, A/C & heat, AM/FMCD player. 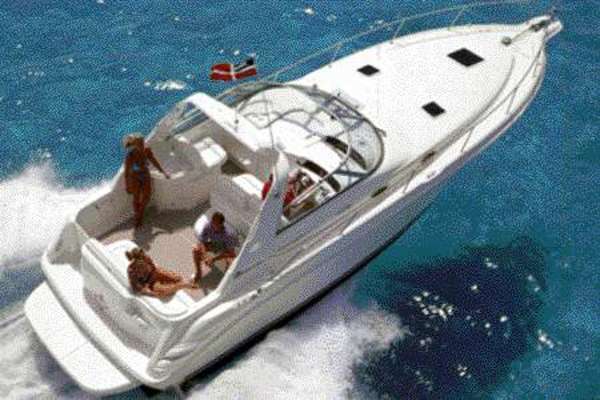 United Yacht Sales New Jersey would love to guide you through a personal showing of this 27' Sea Ray 270 Sundancer Special Edition 1999. This yacht for sale is located in Stevensville United States and priced at $22,000. For a showing please contact us by filling out the form on this page and we will get back to you shortly! The Sea Ray 270 Sundancer Special is fullytrailerablebut still has all the amenities at an attractive price. The cockpit is quite spacious with an adjustable helm seat, portside sun lounger, an aft-facing bench seat and a convenient foldaway aft bench seat. There's also cockpit bolsters for added comfort. The self-bailing fiberglass cockpit liner is durable and easy to clean. A stylish burl wood instrument panel houses Sea Ray's custom backlit instrumentation with low-glare blue night lighting and dimmer control. A transom door makes it easy to get to the large swim platform while a stainless steel transom rail and companionway grab handle make it safe. Storage space is plentiful, beneath the helm and aft-facing seats and in the cockpit side panels. There's also a cockpit cooler for snacks and beverage holders throughout the craft. Inside the cabin is a convertible dinette and V-berth with filler cushions. The interior gets plenty of natural light from a large 20 by 20 inch translucent deck hatch that can be opened for fresh air. There's also 12V directional lighting. The 270 Sundancer Special Edition has a comfortable mid-stateroom with extra sleeping space in a double bunk with storage cabinets and shelves, mirrored bulkhead, screened window and privacy curtain. The 270 Sundancer Special Edition has a complete galley with fiberglass countertop, sink, stove and refrigerator and standard microwave. Fiberglass construction is also used in the enclosed stand-up head where the shower, curtain, sink and portable head with dockside pump-out are all standard. The technical features on the 270 Sundancer Special Edition are just as generous as the space. Dockside power, remote oil filter, dual battery switch, power steering, tilt steering, power tilt and trim and hydraulic trim tabs all make the captain's job a sheer joy. Additional safety features make you feel secure at all times including a halon system, standard carbon monoxide monitor in the cabin, high water bilge alarm and pump and more. A Sunbrella bimini top with interlocking top extrusion, boot and vertical top storage comes with the standard windshield. A 250 hp - 186-kW 5.7L MPI Bravo II MCM stern drive is the standard engine and is upgradeable to the muscular 7.4L MPI MCM Bravo III with 310 hp - 231 kW. There are also impressive Preferred Option Groups and more. In addition to it beingtrailerablethe 270 Sundancer Special Edition comes with one more huge benefit - a full membership in Sea Ray's Preferred Customer Club with Sea Ray Earnings Account. The company offers the details of this vessel in good faith but cannot guarantee or warrant the accuracy of this information nor warrant the condition of the vessel. A buyer should instruct his agents, or his surveyors, to investigate such details as the buyer desires validated. This vessel is offered subject to prior sale, price change or withdrawal without notice. Engine hours are as of the date of the original listing and are a representation of what the listing broker is told by the owner and/or actual reading of the engine hour meters.The broker cannot guarantee the true hours.It is the responsibility of the purchaser and/or his agent to verify engine hours, warranties implied or otherwise and major overhauls as well as all other representations noted on the listing brochure.